Rayston looked over the pair of brain-scanners, connected together by trailing wires. They looked like something you’d see in a hair salon: blue Naugahyde chairs with hollow metal boxes attached at the top, where the head goes. Except for the monitor screens in front. Chairs in a hair salon probably wouldn’t have those. “You want help with that?” Rayston asked, finishing his perusal. “No, no, not with the neuro-stuff.” He shuddered. That one was a mystery. Deenah tilted her head acknowledging his point. Yet, she didn’t think spin alone could keep the government pouring money down the bottomless hole of cold fusion. No, Rayston had a knack for inventing useful objects along the way: endo- and exothermic candies, heat-wave trees, marketable science. She uploaded her new edits to the software — a few debugs and a new algorithm for simplifying the test-subject’s brain pattern. “This time…” she said, looking at the test-subject: one of the biology department’s color-changing cats. “This time, I’ll find out what it’s like to be a cat.” The cat crouched, staring at her, green eyes fixed but every other color in its body flickering and melting as its tabby stripes crawled from the base of its ears down to the tip of its tail. The biologists called their new breed of scrolling-striped tabbies Marquise cats. “It’s a good thing you’re cooperative,” Deenah said to the Marquise, cranking a can-opener around a fresh can of tuna. She set the tuna can on the pile of boxes she’d used as a pedestal for the cat to stand on inside the brain-scanner. The bio-department didn’t have any brain-scanners designed for animals. The boxes only wobbled a little as the cat jumped in, grinning and licking its chops. “Better yet,” Deenah said. “I’ll find out what it’s like to be a cat eating a can of tuna. Hmm. Maybe next time I’ll find a little catnip to throw in…” She rechecked the connections, and then leaned back in her own brain-scanner. Her ears burned as if she was blushing, and her eyes blurred for a moment. When her vision cleared, Deenah’s ears burnt with the heat of a real blush. Her algorithm had failed. Her brain was rejecting the projected waves — they were still incomprehensible. “Damn!” Deenah yelled, slamming her fist against the arm of the brain-scanner chair. The cat startled and, done with the tuna, scurried away. “Damn!” There was no one in the room to rant about it to except the cat, slinking around the door, pawing the crack underneath, asking to be let out. So, Deenah made a tight-lipped frown and fumed quietly to herself. “Okay, back to square-one.” She went over to the terrarium where she kept simpler test-subjects. She’d had her best success with slugs, so far. It was easier dealing with animals whose neural pathways were already completely mapped. 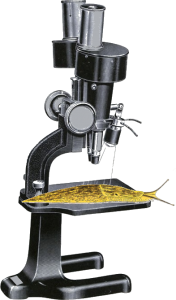 In fact, technically, slugs didn’t even have brains, but their neural pathways were complicated enough to suffice as a control in her experiments. And then Deenah was the slug. She was still Deenah, and she still wished she were at the gravity party instead of working. But her arms were gone; her legs; her clothes; her vision was dim — a mere sense of the quality of light; and, the smell of ozone in the air and the plastic of the petri dish were like mountains before the eyes of a human. The program wasn’t buggy. It just wasn’t any good as a translator. After five minutes, the scanners powered down. Deenah had put them on a timer, since she couldn’t trust herself to remember to turn them off while being a slug, let alone find her fingers for operating the switch. Mmm… the simplicity of slugginess. After the five minutes, Deenah had five fewer minutes until her project review and was no closer to inventing a working Universal Translator. But five minutes isn’t much, and if the next five minutes gave her that Holy Grail — an inspired solution — it could save her hours of hard work. Lean back, turn on, repeat. An hour later, Deenah made it out of the Naugahyde chair and over to her computer where she tried to code for a while. She threw together a hack version of a new algorithm and tried it out on the slug, but her code was bugged and the program didn’t work at all. Two hours of debugging fixed the code, but the new algorithm didn’t work any better than the old one when she lured back the cat. This time, Deenah heard whooping in the halls as she removed the slug from its terrarium. Rayston pushed his head through a crack in the door. She could hear Ivan, Anna, and Keida jostling and joking behind him. Their grants were all safe. They were all thoroughly funded. “Still working?” Rayston asked. Deenah’s pride was hurt too badly — having to work while the others played — to grace Rayston with a proper answer. She nodded curtly and kept her eyes on the slug. Its yellow back and black spots formed an almost obloid shape as the slug scrunched itself up, staying away from the edges of the petri dish. She centered the petri dish on the boxes, fussing with its position until she heard the door shut behind her. She could hear Rayston and the others, laughing as they descended down the hall. She slammed her hands, open palmed, against the seat of her Naugahyde chair. The entire device wobbled, and she bit her lip realizing what a disaster it would be to knock the brain-scanner to the floor. These scanners were expensive, and technically they were both on loan from one of Keida’s projects. Keida could afford brain-scanners. In order to keep herself from asking the question, “Is Keida more successful than me because she’s lucky, works harder, or because she’s simply smarter?”, Deenah punched a new number into the timer and turned the scanner on. Muscles rippled along the sides of her stomach-foot. Her eyes twiddled at the ends of their stalks; her nose, like her eyes now, twiddled too. Her tongue, a spiky radula, flickered in and out of her mouth, sawing satisfyingly at the hearty-smelling greens. When the machines powered down and Deenah remembered herself, she cursed herself inwardly for her caprice. Three hours ago, there might have been time to code, debug, and try out one more algorithm. Now, with only four hours left until her eight o’clock review — she checked her watch three times before she believed it — she only had time to sleep. “Hey,” came Rayston’s voice from around the door. “How’s it going?” He came in and held out a bag of his endothermic candies to her. “Are those the cold ones or the hot ones?” Deenah asked, still trying to shake her three hours of slughood out of her brain. Rayston looked down at the bag. “Endo,” he said. “We were talking about lava flows in zero gee,” Rayston said, still munching the endos, “and Keida went to see if she could find any geologists who knew how to actually model it. Then, it looked like Anna and Ivan might like to be left alone. So, I came to check on you. Is that the slug?” He gestured toward the brain-scanners with his bag of candy. Deenah nodded, her mouth filled with cool strawberry cream. Deenah shrugged, and Rayston handed her his bag of candies so he could crawl into the chair and settle his head on the Naugahyde headrest, inside the gleaming metal and plastic contraption that picked up his brainwaves and projected new ones on top of them. Deenah checked the slug, reset the timer for five minutes, and then flicked the scanners on. The timer clicked, and the scanners powered down. Rayston roused, blinked, shook his head. He didn’t notice Deenah’s drooping chin and closed eyes. His blank look told her that he wasn’t. Deenah took a deep breath and explained her fears. The words came out in one rush once she began. She’d never had a project review before; her project was too ambitious, and she had no proof she could ever accomplish it; all the other scientists around were constantly proving great things or inventing practical objects, and none of them even seemed to work as hard as she did. “I should have finished testing at least five more algorithms by now… And, no matter what I do, it seems to be easier to translate sensory perceptions than actual thoughts.” The frustration drained from Deenah as she spoke. She felt such relief in confiding it. But she was still tired. And it was still too late to have a working projection of a cat brain for tomorrow. She caught the green eye of the Marquise cat, sitting by her computer and licking its paw. It remained as unknowable as cats have ever been. Rayston followed her glance. “So, you can’t do cats yet. So what? What animals can you do?” He went over to the terrarium and started poking around. “Bugs?” he asked. “It’d be great to have all those legs. And wings.” He grinned. “Now?” Deenah asked with exasperation. Rayston straightened up. “You’re right. It’s late.” He put the centipede back. “The slug was good enough for tonight. But, you’re gonna have to let me back in that chair some time.” He caught her eye and leveled his gaze. Rayston looked at her levelly again, and Deenah felt pushed to find a way around the obstacle. Rayston tossed her another endo-candy, and Deenah smiled. “Thanks,” Deenah said, and Rayston wished her good luck as he left her to tidying up the room. She powered down the brain-scanners and her computer, thinking about everything Rayston had said. Maybe she wasn’t so different from the other scientists. Just younger. He’d made her feel a part of the club. Once the slug, her key to wowing the grant analyst, was safely returned to the terrarium, Deenah scooped up the Marquise on her way out. Surprised by the unexpected swooping, Marquise’s claws dug in and tail fluffed out.